In the late 1990s, the libero position was officially introduced for international competition and was first used for NCAA women’s volleyball in the 2002 season. Once a team on defense anticipates during a rally that their opponents cannot attack their third contact, they simply need to call out “free ball” and move to the W formation. 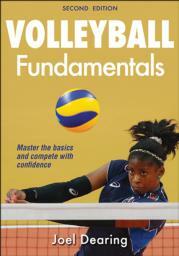 Learn to master essential volleyball skills such as serving, receiving, setting, attacking, blocking, and digging. With this book’s coverage of scoring systems, rules, rotations, and common tactics, it’s never been easier to teach or learn the game. You Can Do It: The skill is introduced with sequential instructions and accompanying photographs. More to Choose and Use: Variations and extensions of the primary skill are covered. Take It to the Court: Readers learn how to apply the skill in game play. Give It a Go: These sections provide direct experiences—such as drills, small-sided games, and six-versus-six gamelike activities—for the reader to use to gauge, develop, and hone the skill.